If you are looking for a quiet, private getaway with plenty of room, Shady Brook Inn may be your ticket! This 4 bedroom, 3 bath home is located in Ellijay in a resort community that offers, swimming, fishing, tubing, hiking, tennis & basketball and a Rec center which is located less than 1 mile from the cabin. Shady Brook sits on about 4 beautiful wooded acres with a creek right in the backyard. Let the kids enjoy playing in the creek on a warm day while you enjoy the spacious covered back porch. After a great day of hiking or exploring the area, relax in the brand new hot tub watching for some of the many whitetail deer that occupy this area. Inside, you will find a cozy living room with a stunning wood burning fireplace and a 42" flat screen TV with DVD player and surround sound. The fully equipped kitchen and dining area is open to the living room providing a feeling of togetherness. There is a Queen Master bedroom on this floor as well as another bedroom with twin beds. Upstairs you will find a bonus game room with foosball table and a futon, allowing for additional sleeping. A large king bedroom also occupies the upstairs with a 42" flat screen TV and DVD player. 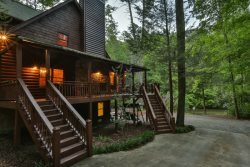 One of the great things about this property is even though you feel like you are a hundred miles away from everything, in reality, you are only minutes from resort activities and downtown Ellijay. Don't wait to experience Shady Brook Inn, and bring the whole family, this home is pet friendly and even has a fenced in area for your furry family! The only items you'll need to bring will be food, beverages, coffee & filters and condiments. Overall it was great! Thank you so much! We had a great time with family during the Labor Day weekend at this rental. It met all our needs and we had plenty of room for everyone. The house was well equipped. Debbie, you were great to work with and I appreciate the ease in which this transaction was handled. I will definitely use your company in the future. Great experience overall with family and friends! Good home environment for both grown ups and children! Great service! Appreciated the call from the staff checking on us. We really enjoyed our stay at your rental. The kitchen was extremely well stocked and easy to use, we loved the property and the house was lovely.